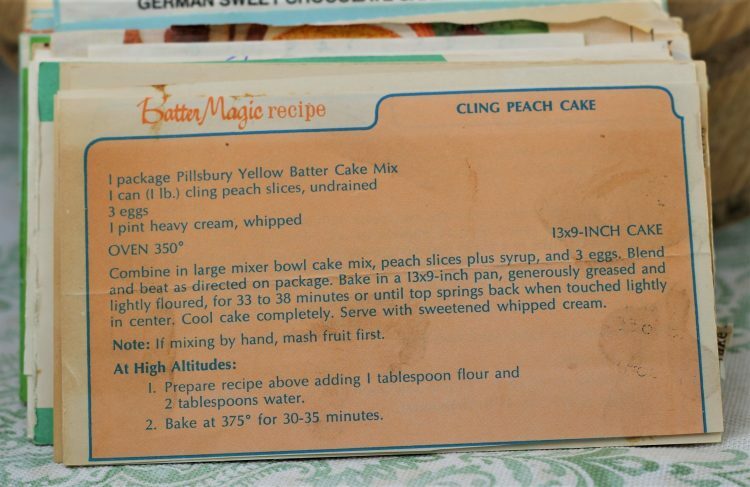 Front of the recipe card for Cling Peach Cake. 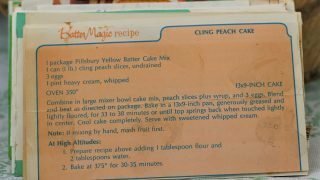 There are lots of fun recipes to read in the box this recipe for Cling Peach Cake was with. Use the links below to view other recipes similar to this Cling Peach Cake recipe. If you make this Cling Peach Cake recipe, please share your photos and comments below! Combine in large mixer bowl cake mix, peach slices plus syrup, and 3 eggs. Blend and beat as directed on package. Bake in a 13x9-inch pan, generously greased and lightly floured, for 33 to 38 minutes or until top springs back when touched lightly in center. Note: If mixing by hand, mash fruit first. Prepare recipe above adding 1 tablespoon flour and 2 tablespoons water.